I am sad to see summer go but it’s hard not to love fall! The colors, the bonfires, and everything pumpkin! It’s the time of year where the best nights are spent snuggled up on the sofa with your favorite blanket, a good book and some hot tea! Fall is also a great time to update your home and plan for projects. Here are some great ways to cozy up your home this fall! Adding colorful pillows to your bed, sofa or accent chairs can be a quick and cost effective way to update your space and add pops of color. Mix neutrals and patterns to create your own unique look! 2. Add soft, colorful throws. Add color, comfort and texture to your room with a throw! Start up the fireplace and wrap yourself up to keep warm or drape one over the sofa to add interest to the living room. Throws are not only stylish, they are functional too! I can’t get enough of them and am sure I have more than one for every occasion. Adding area rugs is an easy way to add color and texture to your floors. The added cushioning and warmth will keep your feet from hitting those cold tile and hardwood floors during the fall and winter months. There are no set-in-stone rules when creating your look. For more ideas check out our post: Decorating Tips: Area Rugs. Unless you’re surrounded by year-round winter weather, your fireplace probably gets a little dusty from March to October. To prepare for cool fall nights, get your fireplace ready for its seasonal debut and have it checked for safety hazards. If you don’t already have one, consider an electric fireplace. A lower maintenance way to stay warm this fall. 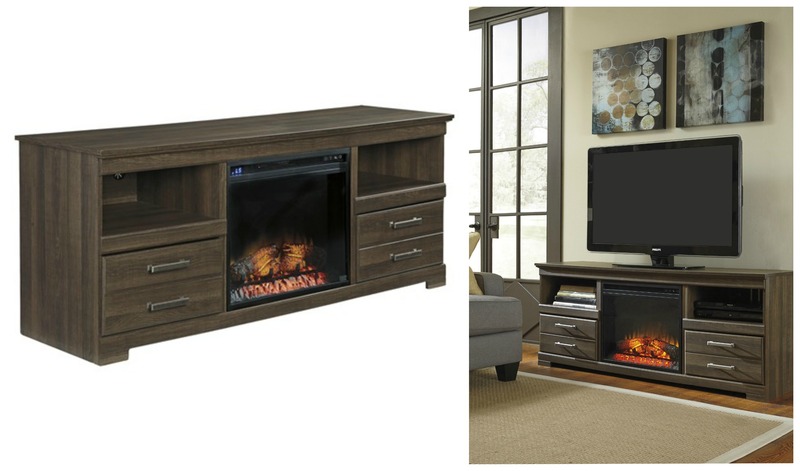 Pictured: Frantin Vintage Casual Large TV Stand w/ Fireplace Insert from Signature Design by Ashley. Now it’s time to grab some pumpkin spice coffee – fill your home with fall scented candles and relax by the fireplace! Visit our Pinterest page or sheelys.com for more inspiration or visit our showroom located in North Lima, Ohio and let one of our awesome sales associates help you furnish your life!